Another lost entry that didn’t transfer correctly from the old site. This one originally appeared on 21 June 2004. (That’s my toe holding down the edge, clad in a Regia 6-Ply Crazy Color sock.) Why rip back? Two reasons. First, I don’t like the one-row color stripe widths that the larger circumference piece sports. 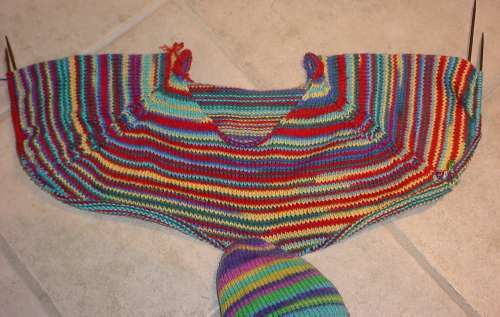 While I realize that stripes won’t be as deep as the ones on my socks, I like the upper part of the yoke better, where the shorter rows and bounce reflections off the neck hole made the stripes wider. Second, I don’t like the way the mini-cable on the raglan “seam” is coming out. I had started this piece on one circ, then moved to two. For some reason, when I moved to two the width of the framing purl stitches decreased considerably. While this tighter look is better, it does leave the upper part looking sloppy by comparison. So having knit up around 2.25 skeins, it’s back to ripping for me. I think I’ll begin again, also doing a raglan, but I won’t get caught up in the idea of matching stripes across the raglan seam (near impossible with this yarn unless you knit in the round). It will be boring as heck, and seamed to boot, but I think the stripes will work out better on shorter width pieces of knitting. Sigh. At least house stuff is going well. Here’s another couple details – the window from the living room, looking out on the porch, and the fireplace from the wall facing it. 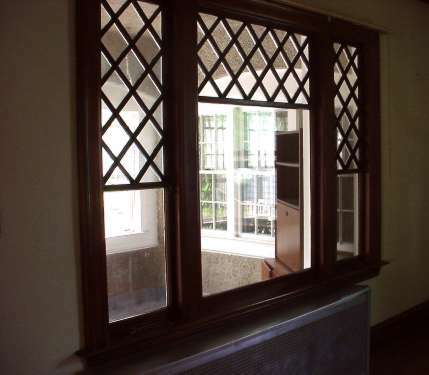 The same window is also on the dining room wall. 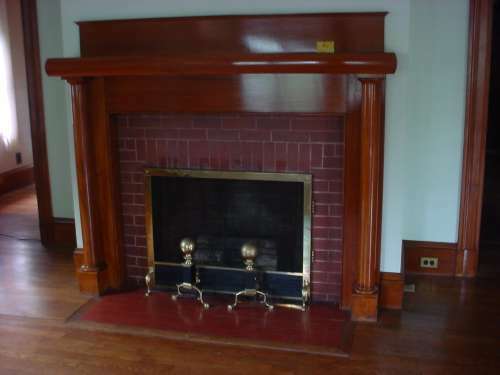 I’m pretty sure that the inside fireboxes of both fireplaces have been rebuilt. To my untrained eye, the plain brickwork surrounds are a bit incongruous, especially with the red tile hearth, but they appear to be original. Also through the window you can see another of my nuisances. The pressboard hutch so generously left by the former owners. The house contains a few pieces of abandoned furniture for which I now have to arrange charitable donation. Grrr.